The Lord of the Tachyon Galaxy Sneak Peek is coming to Galaxy in Naperville on Saturday, 5/11/13, starting at 10 am. And will have a second one starting at 4 pm in Sugar Grove. As with every set, Lord of the Tachyon Galaxy includes 10 Bonus Cards (previously available only in Japan), plus 10 World Premiere cards never before seen anywhere on Earth! You won't want to miss out! At a Sneak Peek, you’ll get 5 booster packs of the latest set, and use just those cards to build a new Deck. The minimum Deck size at a Sneak Peek is lowered to 20 cards. Since only these new cards are used, everyone has a chance to win their Duels! 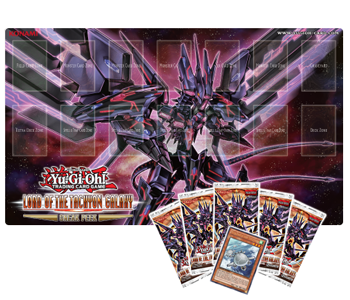 While you’re having fun with your new cards, you might win a special Lord of the Tachyon Galaxy Game Mat. Additional booster packs will not be awarded, but you can buy more packs of Lord of the Tachyon Galaxy on May 17 in stores everywhere!